Have an early reader on your hands? Then you will definitely want to take a closer look at these Word Family practice sheets from United Teaching. Disclosure: We were sent these from United Teaching with the purpose of reviewing to share with you. All opinions expressed are those of myself and my son. We are heavily focused on learning to read with our youngest right now so when I saw that United Teaching had been busy creating Word Family practice sheets we jumped right in. The things we love most about these are the super cute images, he really does love to spend time finishing them off with just the right colour choices. The ease of use, seriously there are no need for instructions at all, just print a sheet and you are on your way. My son really appreciates that each sheet is short and to the point. He isn't asked to sit there forever and trudge through it. Best of all, he loves that he gets to use felt pens on all of his schoolwork and I love the price! 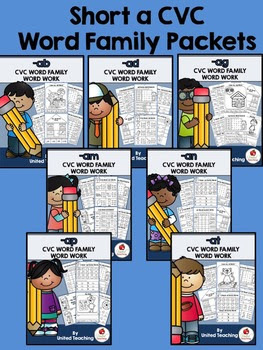 Seriously if you have a child in the early stages of learning to read go check out all of the Word Family packets that United Teaching has available. They will work great as a supplement alongside any reading program you may be using. Thanks to United Teaching for sharing these packs with myself and my son, so that we could share them with you. Looking for more Homeschool related activities? Have a look at my Homeschooling Pinterest Boards. Visit Kylie @ Our Worldwide Classroom's profile on Pinterest.